The listing and price is for ONE STOCKING. 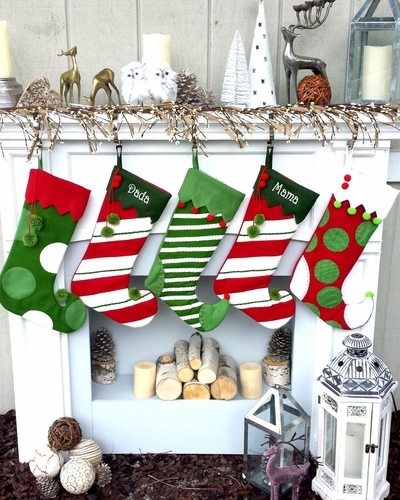 We are showing three stockings hanging together in a group so you can envision what a set would look like when you choose a set. Materials: Soft Felts, Polyester wool blend. Fully lined inside with High quality satin lining. Measurements: This velvet stocking measures 18" long along the diagonal from the top of the cuff to the toe; and the width across the cuff is 6.5". These are on the skinny side because the Jester / Elf toe design really calls for the narrower boot design. Personalized: Names can be personalized on the top - see additional images for available embroidery fonts. Best thread colors for these are White, Red, Green, Silver, Metallic Red, Metallic Green, Gold. Lining: This stocking is lined inside and padded, very soft and high end modern look and feel..